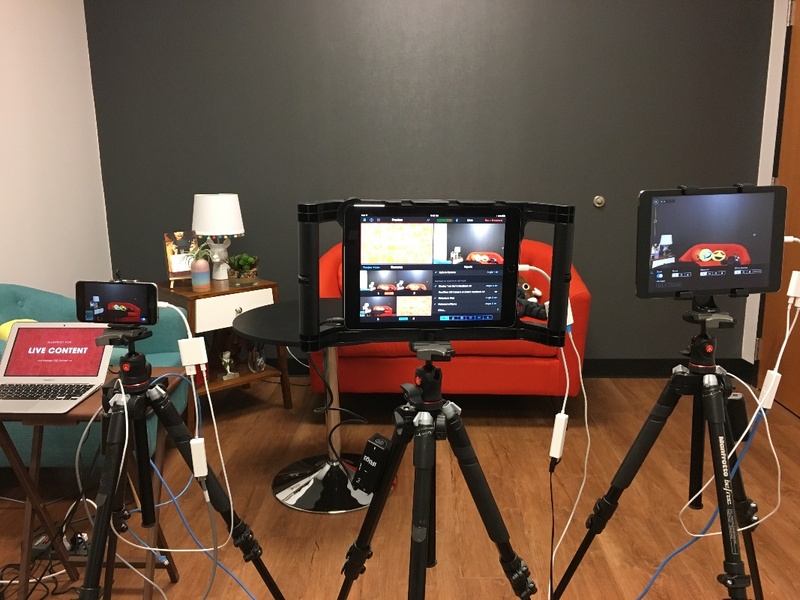 Arguably, the most reliable way to stream live video with Switcher Studio is to hardwire your devices all to the same local network via an Ethernet connection. This is possible on iOS devices by using just a few adapters. Since your cameras will be hardwired over Ethernet, you will not need to worry about wireless interference or dropped frames for your local recording. This is a popular option for crowded venues such as concert halls and convention centers. Connect your router to a hot Ethernet port for your outgoing internet connection. Most venues will be able to set this up; just make sure to check in with them at least a week before your event. If you are working at a large venue, they may provide you with a static IP address. You will need to configure your router accordingly. Note: Setting up a dedicated data drop at a venue or new location may require a fee for setup and data access. Next, set up an Ethernet connection for each iOS device in use. 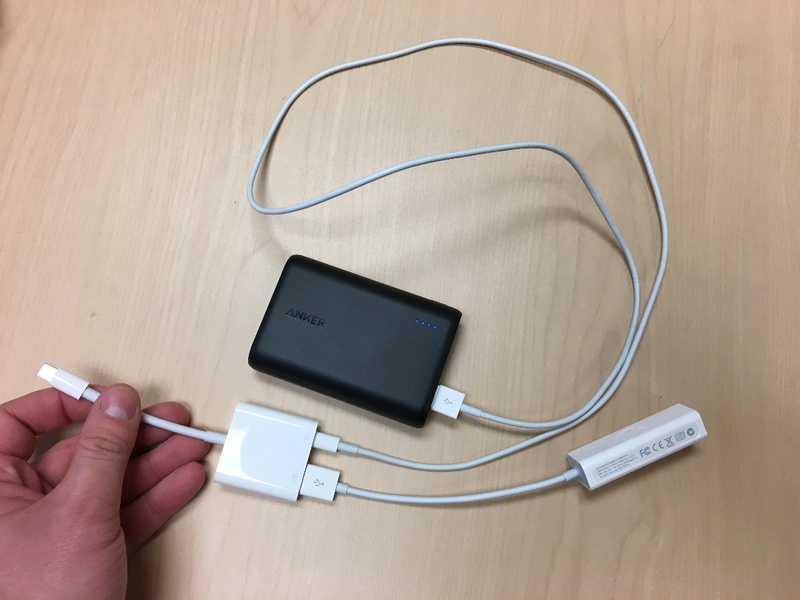 You will need a USB-to-Lightning adapter, USB to Ethernet Adapter, charging cable, and a power source (we used Anker external batteries). Plug the USB-to-Ethernet adapter into the USB slot on the lighting adapter. ***NOTE: It’s important that you use the official Apple adapters, otherwise your device may not register the connection. Now, you are ready to plug the adapters into your iOS device. First, connect the USB-to-lightning adapter to the open lightning connection on your iPhone or iPad. Next, take an Ethernet cable and connect one end of the cable to your router and the other end of the cable to the Ethernet dongle that is currently attached to your iPhone or iPad. *It is important to note that this connection requires power and WILL NOT WORK if you do not have the device plugged into a power source. Pro Tip: Add a small piece of Velcro to your tripod and an external USB battery so the connections are close together and connected. Repeat the steps above to connect your other devices to your router via Ethernet. Now, open the grey Settings app on each iOS device. Go to the "General" tab inside of the Settings app, and make sure that your WiFi is disabled. 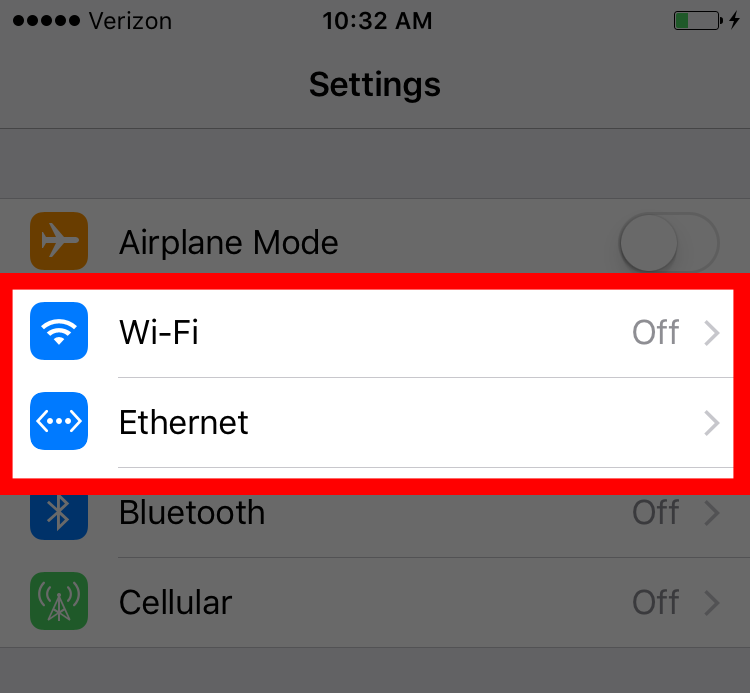 An option for "Ethernet" should appear below WiFi, and you can tap to select the Ethernet connection in lieu of WiFi. Now, it is just a matter of launching Switcher Studio on all your of devices, connecting them in the “Inputs” tab, and going live!